Evaluate Energy has been providing benchmarking tools and undertaking benchmarking studies to major oil and gas companies and their advisors for over 25 years. Evaluate Energy has a proprietary database covering financial and operating data for over 700 oil and gas companies, comprising literally thousands of data points. This is oil and gas data at its easiest to find. Corporate benchmarking allows oil companies to compare their performance over a number of years or quarters against similar size companies, determine their strengths and weaknesses and use it to enhance performance. Many of our clients use our data to provide proof to board members, investors or the wider community of how they are competing against their peers for any number of metrics. Evaluate Energy clients range from Investors, Banks, Corporate clients or advisors who use our data to add value for their clients. They look at metrics that are important for the industry such as exploration expenses, finding and development costs (F&D Costs), reserve data (1p/2p/3p), production data, as well as traditional financial metrics. These items are all included in the Evaluate Energy service and can be downloaded quickly and easily with minimal work or effort. The service will save you time and money when compared with doing the work yourself and is significantly better priced than much of the competition. It is possible to arrange a trial of the service for no charge. For those clients who do not have the analyst capacity to undertake benchmarking work, we provide our own bespoke consultancy service focused on the area we know best – benchmarking. It enables users to choose from 1000s of different line items – taken from company fillings, quarterly reports and annual reports – and compare on a like for like basis. We cover almost 300 of the most important public oil & gas companies world wide, from the majors right down to important players on the global scene. Peer Group Comparison at the click of a button. Build a template and go. Drill down on any figure and calculation and see the underlying assumptions. 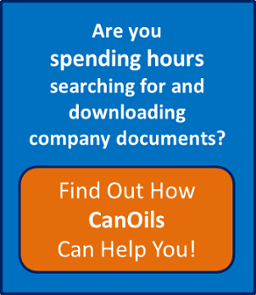 We’ve created a free guide to show you how Evaluate Energy and CanOils benefit corporate strategists in their jobs.